Like its big brothers, the Barber quarters and half dollars, dimes of this type experienced quite a run-up in prices in all grades during recent years the dimes in particular seem to have caught the fancy of collectors after generations of neglect. The publication of useful guide books to each series and the formation of a club devoted to their study aided in the growth of the three Barber silver series. One of the issues raised in these guides and the club's quarterly journal was the question of grading. For circulated grades The Official American Numismatic Association Grading Standards for United States Coins is quite useful overall. 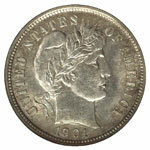 It points out that New Orleans Mint dimes of the Barber type often are softly struck, but stops short of mentioning an important quality affecting the coins dated 1901 and later. During 1900-01 most U.S. coin series underwent a transition in which the existing master hubs were replaced with slightly modified ones. In the case of Barber dimes, quarters and halves, the band on which the word LIBERTY is placed is not as deeply incised for the obverse dies of 1901 and later. Chief Engraver Charles Barber must have believed these changes were improvements, but they have had a subtle effect on the grading of silver coins struck during his tenure. Since this very feature is used in grading coins of this type, some allowance must be made for the later dates. While LIBERTY remains useful in grading these coins, more weight must be given to other features named in the ANA's guide. For uncirculated coins, different elements come into play. 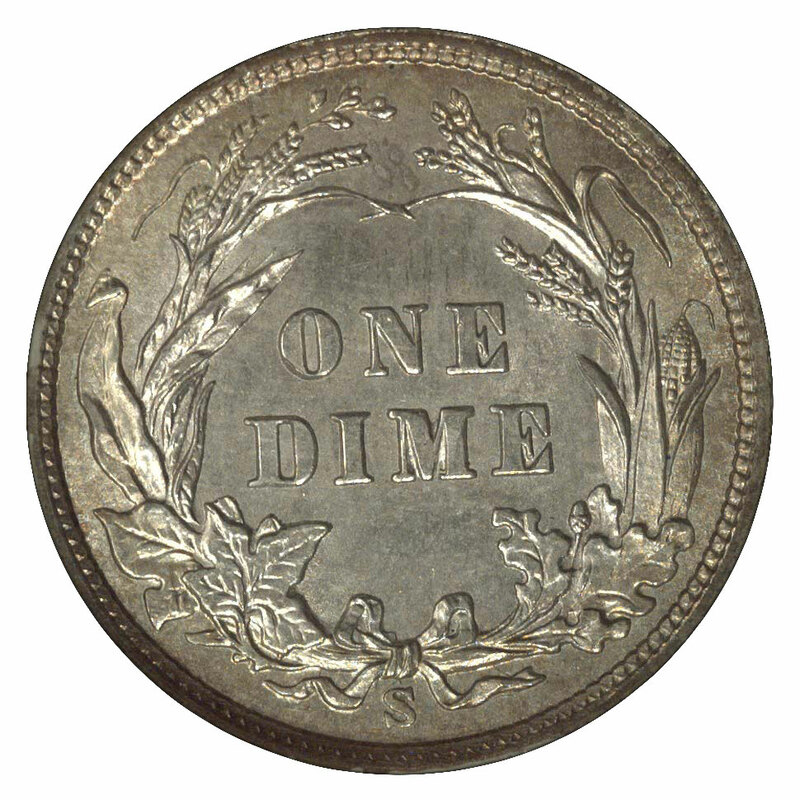 Dimes coined at the New Orleans Mint are notorious for being weakly stuck and often were made from worn dies having dull or irregular surfaces. There are exceptions, but not very many. In contrast, both Philadelphia and San Francisco Mint dimes are usually well struck. While the P-Mint dimes typically are frosty, the S-Mint pieces of early years often show prooflike reflectivity in their fields; later dates (1902-15) are more like their Philadelphia cousins. 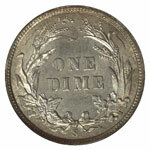 Denver Mint dimes are typically frosty, but they may be a bit softly struck, and a few dates have mediocre luster. By and large, however, they are superior to New Orleans Mint pieces. Proof Barber dimes intended for sale to collectors were coined only at the Philadelphia Mint from 1892-1915. All were produced with brilliant, mirrorlike fields. In the early years (1892-1901) the Mint went to great effort to provide a contrasting frostiness to their relief elements; later dates typically have little or only slight contrast, but they may be gems nonetheless. With the exceptions noted above, the quality of currency strikes and proof dimes was quite high, though many have suffered from mishandling over the years. This includes well-intentioned but misguided attempts at cleaning. Such cleaning might preclude a dime's certification and encapsulation by NGC. Also ineligible for certification are coins that exhibit corrosive residue from polyvinyl-chloride (PVC) holders, artificially toned pieces or those with altered surfaces. Flaws that lower a dime's grade but do not prevent its encapsulation include a few hairline scratches, black spots and minor nicks or abrasions. While not as desirable as pristine specimens, such coins remain collectable.